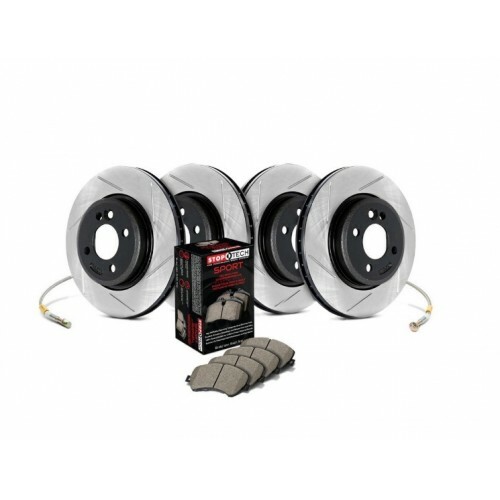 The StopTech Sport Kit is an excellent choice for the enthusiast whose rotors are nearing the end of their service life. 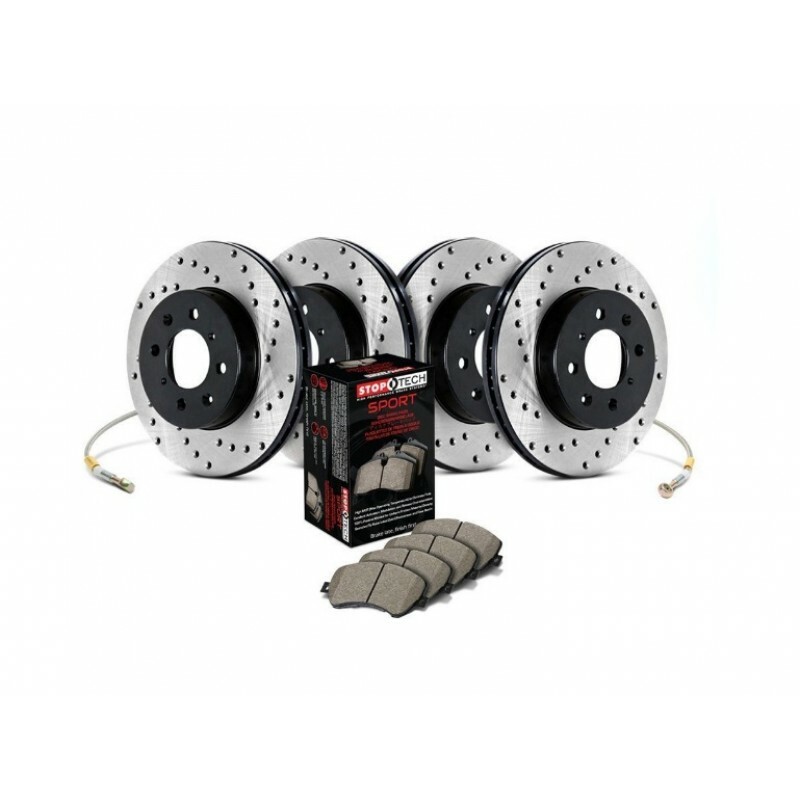 StopTech's Sport Kit includes direct replacement StopTech SportStop OE diameter rotors at all four corners, StopTech Street Performance brake pads front and rear and StopTech stainless steel brake lines all around. Stoptech rotors offer an eye-catching look and provide quicker response in wet weather and improve cooling. Stainless steel lines provide immediate response to brake pedal input and give better feedback. Performance brake pads offer improved stopping power in all conditions with less dust than other pads. Quality is assured as all components are manufactured to meet or exceed all OE specifications. StopTech SportStop brake rotors are made of an alloy developed from the material used in StopTech's patented AeroRotors used on StopTech Big Brake Kits. This material offers superior resistance to cracking due to thermal stress as well as increased initial bite and improved wet weather response. The high Molybdenum content of the rotor alloy extends reliability, service life and reduces noise. SportStop rotors are OEM diameter for a perfect replacement fit and offer OE or improved vane design where possible on all rotors. SportStop rotors provide improved cooling, fade resistance and quicker wet weather response. The rotors are double disc ground for a consistent friction surface with improved bed in and are mill balanced for zero vibration. StopTech Stainless Steel Brake Lines provide a quicker pedal response, maintaining consistent brake pressure and precision brake modulation, especially during threshold braking. StopTech is a registered brake line manufacturer with the United States DOT and all StopTech Stainless Steel Brake Lines are manufactured to meet DOT Compliance Standards. StopTech Stainless steel lines also comply with TUV and FMVSS 106 safety standards. Every line is 100% tested to a pressure of 4,500 PSI. StopTech brake lines consist of a Teflon® inner line, which is then covered with a layer of stainless steel woven braid. The Teflon tube is very resistant to expansion under pressure and will not degrade from exposure to brake fluid. The stainless steel braid provides support for the Teflon and the weave is extremely durable against incidental impact and abrasion. Finally, StopTech brake lines are coated with a clear abrasion resistant cover for maximum protection against chaffing and strain relief devices reinforce end fittings. All necessary brackets and fasteners are included with each line kit. 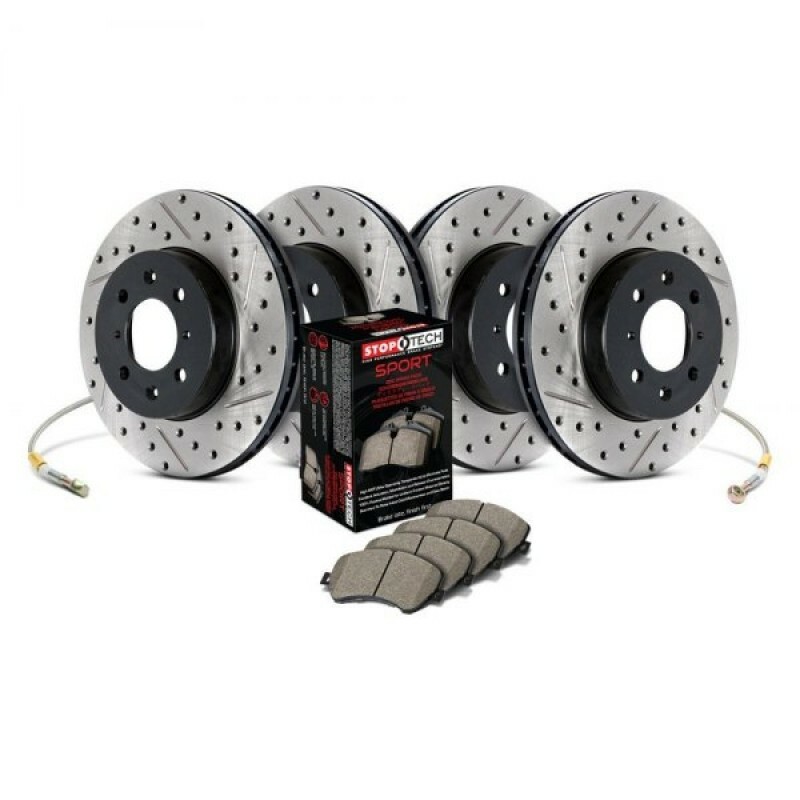 StopTech Street Performance Brake Pads are engineered to meet the demands of high performance driving while maintaining the refinement and comfort expected in everyday driving conditions. StopTech Brake pads combine the benefits of premium street brake pads with aggressive friction formulas suitable for track day and autocross use. Para-aramid composites are specially formulated to provide linear braking response at both cold and hot temperatures, delivering optimum stopping performance over a wide range of driving conditions. The high temperature brake pad compound, coupled with the scorching process used during manufacture ensures predictable and consistent performance across the entire operating temperature range. StopTech's positive mold manufacturing process assures uniform friction material density, delivering even pad wear with consistent pedal feel and performance throughout the life of the pads. The low dust formulation is rotor friendly and leaves wheels cleaner than both OEM and many high performance pads. StopTech Street Performance Pads have precision cut backing plates to fit accurately in OEM calipers and OE style shims reduce or eliminate noise caused by pad vibration. StopTech Brake components are warranted to be free from defects in the materials and workmanship prior to installation. This warranty does not cover labor, misuse, faulty installation, failure of related parts or parts purchased other than from StopTech, LLC.